As we get busier and busier we need to employ more staff to ensure that our high standards of client to guide ratios and overall quality remain. For 2006 we are looking for new members of staff to join our team as either cook/guide/chalet host or all three. This really is a fantastic opportunity for anyone that has a love for mountain biking, mountains and the great outdoors. Please do be aware however that it takes a certain type of person to undertake the work loads required and have the high level of dedication needed to ensure that we do, provide the best mountain bike holidays available. You must be over 21yrs of age by 20th May 2006. If you are under this age then please feel free to send us your details for future consideration. You must be able to work from the 20th May to 25th September 2006. We really can’t budge on this one, we need people for the whole season. The more information that you can provide us with the better. A proper CV with relevant experience and any qualifications is essential. You do have to be a good rider to be a good guide but in order to be a great guide there is a little more to it than just riding ability. We are looking for 10fifty people, If you have been on holiday with us you will know the type. People that can install confidence in people and know when to have fun and when to knuckle down and crack on with the work that’s at hand. The hours are very long and working 6 days a week is hard. We are a small company and everyone works as a team if you do have any previous experience in catering, outdoor activities, foreign languages (French) and mountain bike guiding, (obviously), then all the better. The workplace of a 10fifty mountain bike guide, better than your average office view! If you are interested in cooking rather then guiding, then here are a few pointers for you. You must be able to produce high quality tasty food. Three courses, each to complete the other five days a week. Shop to a budget and keep on top of supplies in the chalet. Run a clean and tidy kitchen/chalet. Be time efficient. 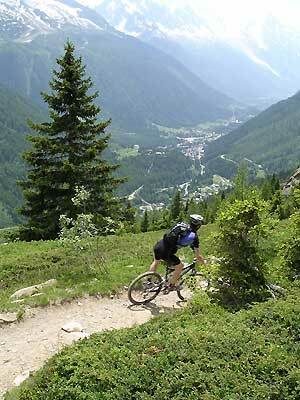 The more that you are the more time you will have to ride/climb/relax/walk/enjoy the mountains! Please contact us if you are interested and we can let you know what food/standards we require from you. Good luck, just think a whole summer of mountain biking in probably the best mountain bike location in the world with probably the best mountain bike holiday company in the world!